Be the first to share your favorite memory, photo or story of Jose. This memorial page is dedicated for family, friends and future generations to celebrate the life of their loved one. 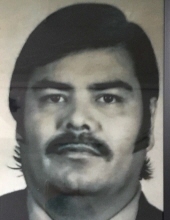 Jose M. Escatel-Castaneda, 70 of Amboy passed away February 6, 2019 in Maple Crossing, Amboy. Mass of Christian burial will be Saturday, February 16, 2019 at 12:00 in Holy Cross Church. Rev. Peter Pilon will officiate and burial will follow at Holy Cross Cemetery. Visitation will be on Saturday 16, 2019 from 9am until 11am in Schwarz Funeral home. Jose was born March 2, 1948 in Totatiche Jalisco Mexico to Panfilo and Maria Cruz (Castaneda) Escatel. He was employed as a machine operator for Del Monte until his retirement. He was a member of Holy Cross Church. Survivors include; two daughters: Eva Escatel of Miami, Florida and Teresa (Jose) Aquilar of Sterling; one son: Jose M. Escatel of Kentucky; 2 granddaughters; one sister: Herminia (Rogelio) Magallanes of LaSalle; and two brothers: Luis (Guadalupe) Escatel and Rodolfo (Luz) Escatel both of Mendota. He was preceded in death by 2 sisters: Rosario Escatel and Juventina Godina, 2 brothers: Rutilio Escatel and Reyes Escatel, and his parents. Memorials may be directed to Holy Cross Church. To send flowers or a remembrance gift to the family of Jose M. Escatel-Castenada, please visit our Tribute Store. "Email Address" would like to share the life celebration of Jose M. Escatel-Castenada. Click on the "link" to go to share a favorite memory or leave a condolence message for the family.